Fun Numbers: How much would ISIS have to pay for it's publicity? I often have fun with back of the napkin calculations, they occasionally help you get a good idea of how big numbers can get and what they can look like when reallocated. Today's question: If ISIS had to pay for the amount of publicity they've gotten on cable news networks, how much would they have to pay? Well normally, a 30 second slot during the noon news on your local station will go anywhere from $200-1,500 per 30 second slot. An article recently highlighted that CNN was charging $200,000 for a 30 second ad during the Republican National debate (40x their normal pricing). Let's assume that all cable networks charge CNN's normal amount for cable advertising for all their slots (a conservative estimate for a reason). That comes out to $5,000 per 30 second slot. That comes out to $10,000 per minute or $600,000 per hour. Now given all the media attention behind ISIS, we can conservatively estimate that roughly half of the news coverage involves them in some way. However, cable news is riddled with (you guessed it) advertising so let's bump it down from 12 hours of 24-hour news coverage to 8 hours. That means that every day, ISIS gets $4.8 million in free publicity from a single day on a single network. So bumping that up to a news cycle (1.5 weeks) we know that they roughly get $52.8 million per cycle. But it's larger than that! 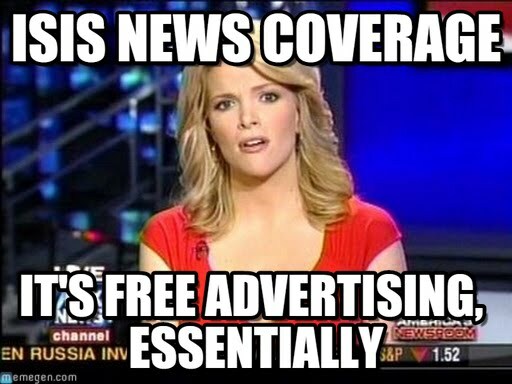 We have lots of news networks in the US including CNN, Fox News, CBS, ABC, NBC, MSNBC. That comes out to $316.8 million per news cycle on all the major networks. Now the fun part, what could you do with $316.8 million every 11 days? Assuming the average cost of college for the past academic year (approximately $24,061), you could give 13,000 students a free ride scholarship every 11 days. Using the average cost of healthcare for a family of four, every 11 days you could give free healthcare to 14,000 families for the year. Pay for the salaries of roughly 1,800 members of congress (that comes out to a few more than four years of congress). Give Water Wells for Africa enough to build 45,000 wells every 11 days. At this point it begs the question, do they deserve that kind of attention?